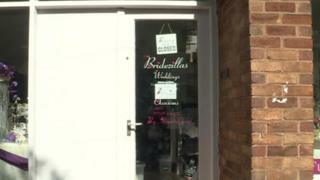 A wedding business has ceased trading amid a backlash from angry couples getting married.Bridezillas, based in Morley, near Leeds, has come under fire for not delivering promised goods, being late and not turning up at all on occasions.The firm is also facing refund demands from couples who have paid for room dressing and other services in advance.The BBC has approached Bridezillas for a comment but is yet to receive a response.The firm provided flowers, decorations and items such as tablecloths for wedding venues. "I had no flowers, no decorations for the room, nothing," she said.Another customer, Rachel Treble, said she had paid Bridezillas ?500 to decorate her wedding venue in two weeks' time. "I'm gutted - I'm heartbroken - but I need to let it go otherwise it will end up spoiling the day," she added.She said she was looking to make alternative arrangements. Others vented their anger on social media.Jemma Benton wrote: "This so-called company have been fobbing me off for three weeks after only turning up with half of what I had paid for at my wedding. "Now I know why. "Some are also posting offers of help, including other wedding dressers who say they will step in wherever possible. Bridezillas announced its closure on its Facebook page on Thursday morning, citing threats made against its owners.A message read: "It is with the deepest regret I have to inform everybody that with everything that is going [on] we have had to cease trading and we are now even afraid to be within the shop or our home. "It said it was currently seeking legal advice.West Yorkshire Training Standards said it was aware of complaints and was seeking an urgent meeting with the business. » Royal wedding 2018: How popular is your wedding day?